Most beauty experts and fans alike will agree that it's best to give your nails a breather every couple of manicures—the chemicals in most lacquers can be rough on your fingers, and overdoing it can lead to dryness, yellowing, and other less-than-sightly issues. But we can also understand that if you're addicted to the polished look (so to speak) of a great manicure, it can be exceedingly tough to choose between your beloved lacquer and superior nail health. (And if it's an event-heavy couple of months? Well, leave it to Sally Hansen to eliminate the dilemma altogether. 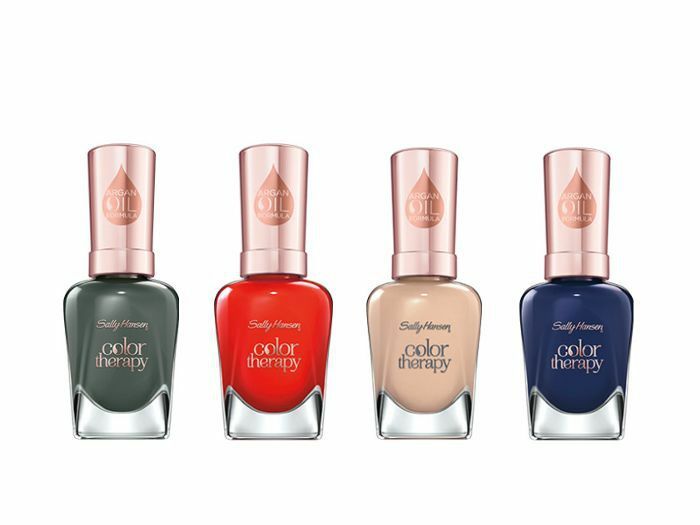 The beloved drugstore brand's latest collection fuses nail treatment with color, so every formula conditions and repairs nails as you wear it. Nail polish that's actually good for our nails? Also, why has this taken so long to become a thing? Keep reading to get your first look at the collection. The secret is the argan oil–infused formula since the natural elixir does wonders for repairing and strengthening your nails (in addition to skin and hair, natch). Case in point: When the brand asked women to test out the new polish, 90% saw a noticeable improvement in their nails after wear. The collection boasts 33 stunning shades dreamed up by the company's global ambassador, Madeline Poole, and each bottle runs at a very reasonable $9. Not needing to say a silent prayer with each new coat of lacquer? Snag the polish when it hits drugstores in December.